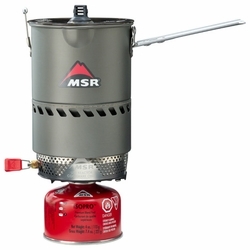 MSR Reactor Stove System. Not only is the Reactor Stove System the fastest and most fuel efficient stove ever made, it’s the only one that delivers that level of performance in the cold and wind of the real world. While that might sound like hype, take a look at these test results and see exactly what that means to you in the field. Simply put, you’ll burn less fuel, carry less fuel, and move faster than with any other stove available. And with MSR’s proven quality and durability, you can be assured of that performance to pull you through when you need it most.